Vintage films on Coca-Cola and how this product has had an effect on pop culture here at home, and around the world. Much of the focus is on the 40's and 50's. This DVD contains vintage films on Coca-Cola and how this product has had an effect on pop culture here at home, and around the world. Much of the focus is on the 40's and 50's. It contains short ads and sales promotional films, as well as a look at the impact Coke has had across the globe, mainly the Philippines. Contains many little know facts about Coca Cola. This is a great addition to your Coca-Cola collection. Any Coke collector should have this DVD. 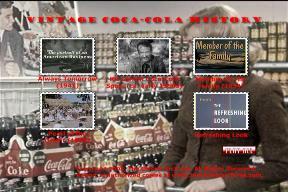 Dramatized history of the Coca-Cola company and some of the people who participated in its origin and growth. Made in the style of a feature film. And simply put, I think it is a really cool old film that depicts life in a simpler time, when it was still OK to leave little Susie out on a bench in front of the store. Gatherings of families and friends. Playing basketball, baseball, and tennis. And "pure, wholesome, delicious, ice-cold Coca-Cola." The phrase of hospitality is: "Let's have a Coke!" "Member of the Family," produced by Jam Handy in 1954, is a striking document of America's post-war influence and the beginning of corporate globalism. The film simultaneously appears to extol American values while also presenting Coca-Cola as a locally made product and an integral part of Filipino culture and industry. More on Coca-Cola's presence in Philippine culture. Shows many local events and gatherings, how Coke is made down there, and how it is a delight when it is passed out in glass bottles. This little film shows of the new product line of Coke vending machines. You will watch salesman go to customer sites and try to get them to install a new Vendo vending machine.